Animal tissues. Blood. Atlas of Plant and Animal Histology. Blood is the liquid found inside the blood vessels and heart. Heart beating and body movement push the blood through the cardiovascular system, which reaches every part of the body. Blood has many functions, being the transport of nutrients and oxygen two of the most important. It is also responsible for carrying waste products from the body to kidneys and lungs, and maintains a constant and homogeneous body temperature. The immune system is a population of cells that use blood and the cardiovascular system to reach every part of the body and fight against any pathogen or external molecules. Blood is regarded by many authors as a specialized type of connective tissue composed of cells, cell fragments and a liquid extracellular matrix known as blood plasma. Blood cells are classified into two types: red blood cells or erythrocytes and white blood cells or leukocytes. Blood also contains cell fragments called platelets. Leukocytes are subdivided into granular: neutrophils, basophils and eosinophils, and agranular: lymphocytes and monocytes. 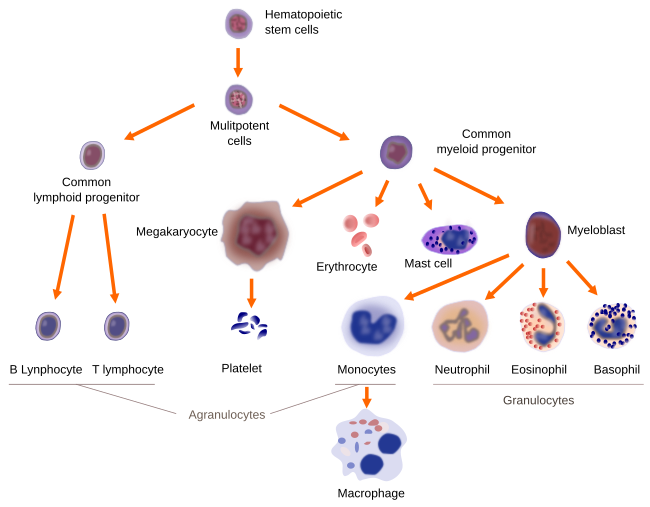 Main cell types that can be observed in a human blood smear. Erythrocytes give the red color to the blood beacuse of its high hemoglobin content, a protein which has iron in its structure. The main role of erythrocytes is transport O2 and CO2. Erythrocyte, in mammals, can be considered as a modified cell for these functions because it has no nucleus and lacks mitochondria and other cellular organelles. It is shaped as a biconcave disc of about 7.5 µm in diameter, which gives larger exchange surface with the blood plasma. Erythrocytes are approximately 45% of blood volume. Cells in the human blood. Platelets are small portions of cytoplasm without nucleus. Their main function is cooperate on agglutination and blood coagulation. They are present in mammals, but not in lower vertebrates. Platelets are generated by fragmentation of the cytoplasm of megakaryocytes, a cell type found in the bone marrow. Leukocytes (white blood cells) have a nucleus and are colorless in fresh blood. Their main function is to defend the body against external aggressions such as pathogens and internal aberrant alterations. These functions are performed outside the blood, as they have the ability to cross the vascular wall and act on the damaged tissue. Actually, they use the circulatory system to move through the body. Leukocyte cytoplasm contain two types of granules: azurophilic or primary granules, which are lysosomes, and specific or secondary granules containing diverse types of substances. Leukocytes are classified into granular and agranular. They all have azurophilic granules, but the specific granules only appear in the granular leukocytes. Granular leukocytes are neutrophils, eosinophils and basophils, whereas agranular leukocytes include lymphocytes and monocytes. Neutrophils are the most abundant granular leukocytes and account for 60-70% of all leukocytes. They are easily recognized by their multilobed nucleus. They show cytoplasmic azurophilic granules, but the specific granules are more abundant. Specific granules contain lysozyme, complement activators, collagenases, etcetera. They are very important in the defense against bacterial infections. Eosinophils are up to 2 to 5% of the leukocyte population. Their nucleus is bilobed and their cytoplasmic specific granules show a strong affinity for acid dyes such as eosin. These granules have basic proteins such as major basic protein and eosinophil cationic protein, which are involved in the control of parasitic infections, and histaminases that neutralize the action of histamine in allergic reactions. Basophils are the less abundant and smaller granular leukocytes, account for 0.5% of the total leukocytes. Its nucleus is slightly lobed. They contain specific granules which are stained by basic dyes such as haematoxylin. The cell membrane of basophils has receptors for immunoglobulin E, and the specific cytoplasmic granules contain histamine and heparin. Thus, it is suggested that these cells act at the connective tissue in cooperation with mast cells. Agranular leukocytes lack specific granules in their cytoplasm, but have a small population of nonspecific granules. Lymphocytes are the second most abundant type of leukocytes, after neutrophils, and account for 20 to 35% of leukocytes. They are small, although showing some variability in size, which appears not to be related to the different types of lymphocytes. The two main groups of lymphocytes are B and T. Both are major players in the immune defense of the organism. The other agranular leukocytes are monocytes. Monocytes show a large size in blood smears and have a kidney-shaped nucleus. They help in the defense of the body by leaving the blood and moving to the site of infection or injury, where they become macrophages. Lineages of the cell types found in the blood. Progenitor cells are located in the bone marrow and macrophages and mastocytes in the connective tissue. Plasma is the liquid part of the blood and accounts for more than half of the blood volume. It consists of many different molecules, from ions to large proteins. It is the main transporter of nutrients and waste products.